We have completed repairs to the plaster surface of the war monument in Thames. These repairs were a result of a Lotteries grant and a contribution from the Thames Community Board. Following these repairs the Community Board prioritised a master planning exercise to look at a complete refurbishment of the site including improved access, remediation of current retaining walls and refreshing the landscaping. A concept plan was developed by local Landscape Architect Kerstie van Zandvoort in consultation with community and the RSA. The war memorial in Thames is unmissable: it towers on a hill overlooking town and is a prominent reminder of the sacrifices made by our nation's World War I generation. The monument was originally unveiled on Anzac Day in 1925 and commemorates those from the Thames area who were killed in the Great War. Thanks in part to a Lotteries grant of $59,990, the memorial was restored in 2016 after cracking in the plaster surface was discovered. This restoration was completed by 11 November 2016, the 98th anniversary of Armistice Day. Lighting was installed in time for Anzac Day 2017, so now the monument can be picked out in appropriate colours at different times of the year. 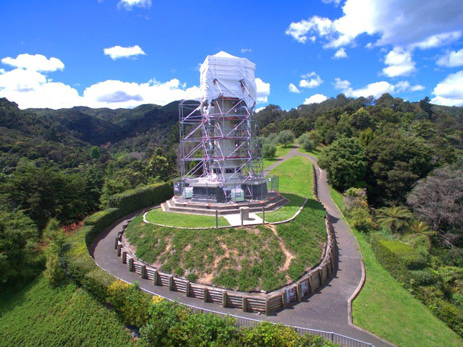 The budget of $250,000 (spread over three years) was set aside in the Long Term Plan 2018-2028 to landscape the grounds surrounding the monument to make them more accessible to people with mobility issues and to highlight the story of New Zealand's involvement in WWI. External funding will be sought to offset the cost to ratepayers. Further work is being undertaken to take the concept plan into a detailed design. This work includes geotechnical, stormwater as well as other improvements to this iconic site. The intention is to take the detailed design back to the Community Board and the RSA along with more accurate costings for a final decision on the design ahead of physical works. Once more accurate costs are known then external funding will be sought and construction may be phased over three years. The Thames War Memorial has always been a prominent reminder of the tenacity, bravery and honour of our World War I generation. The towering war memorial overlooking Thames and the Firth is about to be revealed from the scaffolding that has covered it for the last two months while repairs to its plaster surface have been carried out.